Here’s one measure that illustrates how big podcasting has become: As of June 2018, Apple says its podcast platform includes approximately 550,000 active shows. That’s a lot of audio vying for your ears and your time. 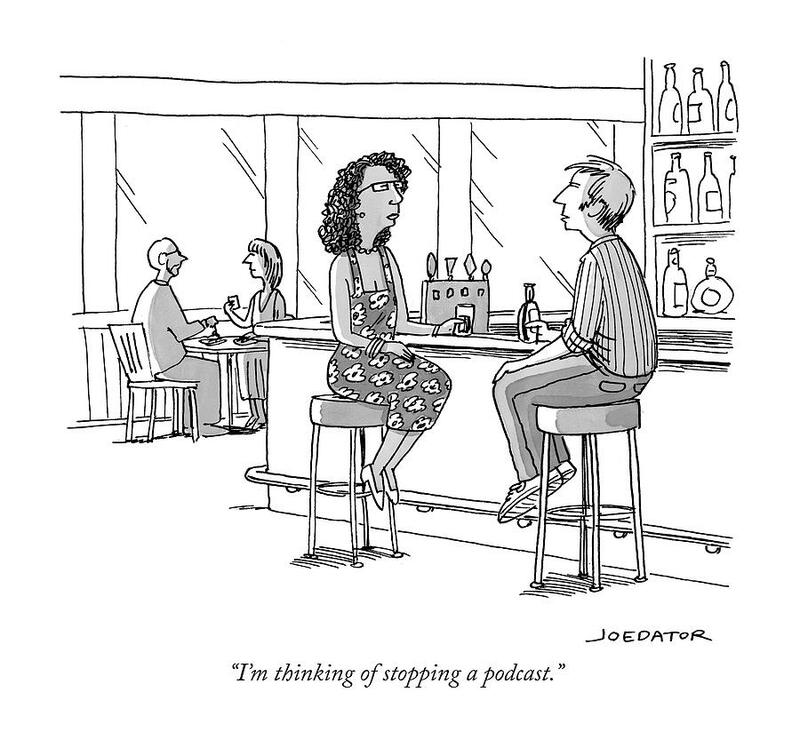 So it might seem more groundbreaking to stop a podcast rather than start one, as the great New Yorker cartoon above bluntly suggests. But if you, like so many other people and organizations, are considering starting a podcast, we want to help you do it well. Almost anyone who starts a podcast can regale you with lessons they learned the hard way. No process of creation will proceed smoothly 100 percent of the time. The questions and suggestions below can help you fashion an intentional creative process in which you ensure you truly understand what you’re making, for whom and why. These tips come from people at NPR who have created multiple podcasts and closely observed the growth of the podcast industry. Before you get started, you need to spend some time thinking about what you want to make and who you’re making it for. Ask yourself some deep, difficult, even existential questions. The more specific you can be in your answers, the better. What is this idea? No, really. What is it? Is a podcast the best format for this? Why? What makes this distinctive from other similar podcasts? How passionate are we about the story/concept? Why are we the right people to make this podcast? Do we have the people, time and resources to make this? It’s easy to get so excited about an idea that we coast on our own enthusiasm. We forget that our project lives or dies based on listeners’ enthusiasm. You might love your podcast idea, but why might another person love it? As you try to define an audience, be as specific as possible. “Everyone who likes good narrative storytelling” is not a viable definition of an audience because it doesn’t provide much direction. “Young adults ages 18-30 who love good narrative storytelling, have at least a 15-minute commute and feel hopeless about American politics” is getting closer. You can get even more specific than that. Who would want or need this podcast? What unique value or perspective can we add to listeners’ lives? Are we trying to reach an existing audience or a new one? What kind of experience do we want our audience to have? Where are our listeners when they listen? What are they doing? How are they feeling? After listening, what will they talk about? Who will they share the episode with? Why? This is a good point in the creative process to pick up NPR Training’s Project Blueprint. It will help you add more definition to your podcast and turn your ideas into a reality. Once you’ve defined your audience and started to shape your project, it’s time to start making something. Don’t expect the process to be perfect, but here are some do’s and don’ts that can help smooth the process. Carefully consider who you pick to be your podcast host. Is it someone listeners would want to hang out with? The quality and approachability of a host can make or break a podcast. Be hyper-conscious of the crowded competition for ears. Be able to say in one sentence why your podcast is different, both in general and in comparison to similar podcasts. Pitch to publishers or partners as if you were “wooing” someone. Define what success looks in terms you can measure (downloads, users, critical acclaim, etc.). Don’t underestimate the production time. Good podcasts are hard to make. Don’t expect listeners to find you! If you build it, people won’t come. You have to find them! Don’t treat launch as the end of your development, but as a beginning. Ask your audience for feedback and be willing to iterate based on what you’re hearing. Failure is an option — and if it happens to you, embrace it. First of all, trust your gut (and your analytics) if something doesn’t seem to be working. Be flexible and willing to pivot. If that doesn’t work, maybe it’s time to take a break or officially end production. This is OK. If you can treat failure as a learning opportunity (in which case, we shouldn’t even call it “failure”), you may cultivate the seeds of future success. Thanks to NPR’s Neal Carruth, Liz Danzico, N’Jeri Eaton and Steve Nelson for the guidance we’ve compiled here.